During Sea Week in March, the Yellow-eyed Penguin Trust staff and volunteers got involved in Our Seas Our Future’s beach clean-up. We focused on the area around Smaills Beach and were shocked at the amount of rubbish dumped just off the road side into the bushes. 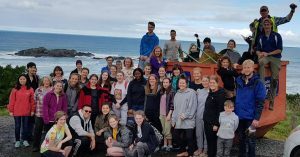 After Sea Week we raised the issue with Dunedin City Council and they agreed to assist us and organise a skip, so on Saturday 14th April, we headed back with an army of volunteers. Students from University of Otago Hall of Residences Hayward and Cumberland, staff and students from the Marine Science department, Our Seas Our Future volunteers and staff from the Trust got stuck in to clear out as much rubbish as possible. With the fantastic team effort, we filled the skip and a ute within an hour and a half. A huge thank you to over 50 volunteers who turned out. The clean-up even featured in the Otago Daily Times on Monday. You can see the full gallery of photos on our Facebook page here.